When spring peeks around the corner every year, people look forward to warmer weather more than anything. After what feels like ages of snow, ice, doom, and gloom, getting out the sandals, shorts, and t-shirts can make us feel like we’re spreading our wings for the first time. But while cold weather is the last thing on our minds once the thermometer starts to rise, winter always returns, and when it does, we’ll need to layer-up again. For people who live in areas that experience all four seasons, it’s important to take care of winter-weather gear so it’s ready to go when the snow begins to fall. For the heavy-duty boots and shoes we wear in the winter, the bottom of the closet often ends up being their summer vacation destination. But for taller footwear, particularly boots that rise above the ankle or up the calf, the “neck” of the shoe is not rigid and will flop over without the wearer’s leg holding its form. This can cause stress and stretch the leather, resulting in creases and wrinkles which prematurely age your shoes. To help prevent this, foam represents a surprisingly quick, affordable, and creative solution. Polyethylene foam cylinders, commonly seen as as pool noodle toys or exercise rollers, are soft but rigid forms that, when inserted into a boot, help the shoe hold its form. Made in various lengths and diameters, finding a foam cylinder that fits your shoes is probably easier than finding shoes that fit your feet! A closed-cell foam, polyethylene is very easy to cut, so buying extra-long foam tubes multiple feet in length means you can support and protect multiple pairs of boots by trimming off sections from a single cylinder. Using a sharp, serrated knife, you can slice through polyethylene like you were cutting a loaf of bread. Trimmed to a length a little shorter than the height of the boot, you can slide the cylinders down to the heel and get a pair of shoes that stand straight up, without even seeing the foam support holding them upright. In the before-and-after picture shown in in this post, you can see a pair of leather boots slouched over. With the foam cylinders inserted, they stand upright and hold their shape. For your uses, you’d want to trim off the foam sticking out of the boot, both for aesthetics and to use the material on another pair of boots, but we left them intact in the image to highlight the rigidity of the material and to show you don’t even need the largest possible diameter to get the job done. In addition to function, foam shoe bolsters for shoes are just as useful for maintaining form, literally and figuratively! For people who have significant shoe collections, keeping them standing upright on display can tidy up a closet, make it easier to find the pair you’re looking for, or even help you pick the right shoes for an outfit. This support method is a great way to take care of rain boots, high-heeled boots, or even cowboy boots, year-round. Supporting boots with a foam cylinder can even make polishing and cleaning them easier. Halving cylinders length-wise also helps expensive dress shoes, flats, and low-ankle slide-ons keep their shape. The Foam Factory sells many sizes of polyethylene foam cylinders, with seven diameters available, ranging from 1-1/2” to 6”, and three different lengths: 17”, 5”, and 70”. Custom-cutting services are available for sawing cylinders to exact sizes, as well as halving them length-wise for individuals who prefer not to make cuts at home. 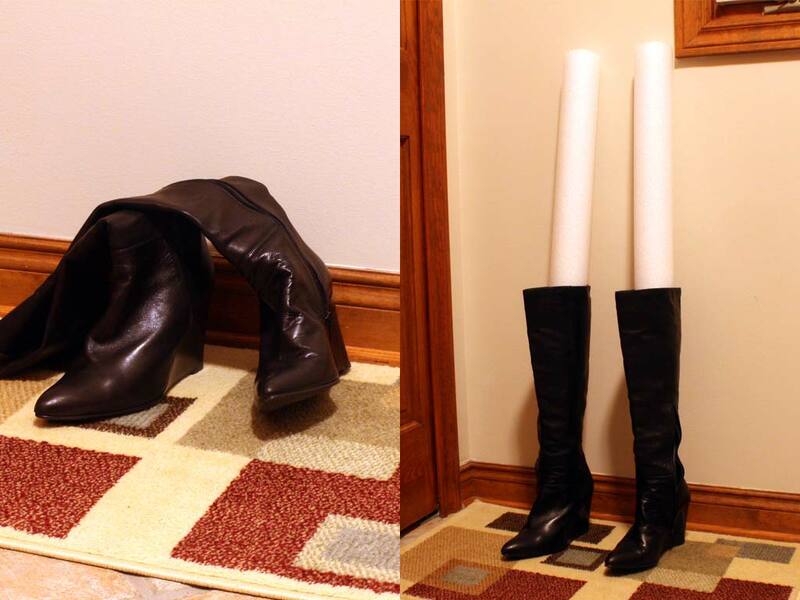 If you’re looking for a way to keep your shoes and boots in good condition all year, or just need to organize your closet better, keep them in shape with polyethylene foam cylinders. You can see The Foam Factory’s polyethylene cylinder selection Here.